Mario Lopez has a new book—and a health message for America's families. During his five years on Saved By The Bell, Mario Lopez appears to have listened during English class. Along with becoming a TV host (Extra) and emcee, the actor behind A.C. Slater has also become a ... drum roll, please ... New York Times bestselling author. Somewhere, Mr. Belding must be beaming. Mario&apos;s diet book Extra Lean achieved that status in 2010. The fat-burning focus now shifts from the individual to the household with Extra Lean Family (Celebra Hardcover, 2011). The book arrives not a moment too soon. As Mario once told me during the interviews for a book we were writing, Mario Lopez&apos;s Knockout Fitness, America faces an obesity epidemic, not an I-can&apos;t-see-my abs problem. Mario—who does have abs—is looking to affect a broader public-health crisis. BBQ Chicken with Rice & Beans and a Cucumber Salad. Heat grill or grill pan to medium-high. Season chicken breast with 4 teaspoons canola oil, salt, and pepper. Place on grill and cook for 6 to 7 minutes per side. 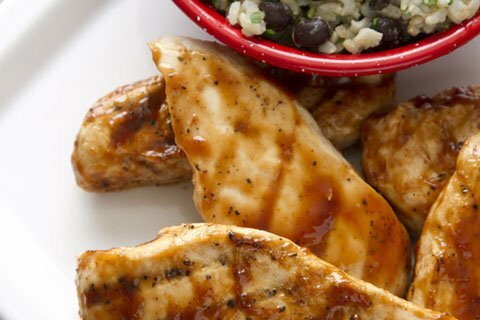 Brush each side with barbecue sauce and cook for an additional 2 to 3 minutes or until cooked through. Transfer to a plate and squeeze fresh lime juice over the top. While the chicken is cooking, prepare the rice and beans. Heat remaining oil in a large skillet, add garlic, bell pepper, cumin, and 1/4 teaspoon salt-sauté for 2 to 3 minutes. Add black beans and brown rice and continue to cook until rice is warm. Mix in cilantro and serve. Tip: Canned beans are a huge time-saver. Make sure to rinse them thoroughly to get rid of some of the sodium. Place sliced cucumber in a large bowl and season with salt. Toss well and set aside for 5 to 10 minutes to allow cucumber to release some of its water-drain well. Add vinegar, red onion, and black pepper; toss well and serve. Chicken Enchiladas with Homemade Chicken Stock. Preheat oven to 350 degrees F. Spray a 9x9 square baking dish with nonstick cooking spray and set aside. Heat oil in a large skillet over medium heat. Add onions and celery and sauté for 2-3 minutes. Sprinkle with flour and cook for an additional 1 minute to allow the flour to cook. Stir in chicken stock, cumin, salt, and cayenne pepper. Add chicken and spinach and mix to combine (if mixture appears too dry, add more chicken stock). 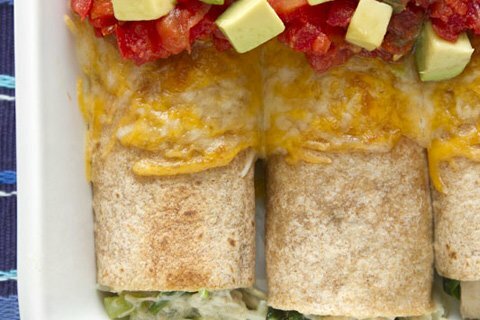 Fill each tortilla with the chicken mixture, roll up, and transfer to prepared baking dish. 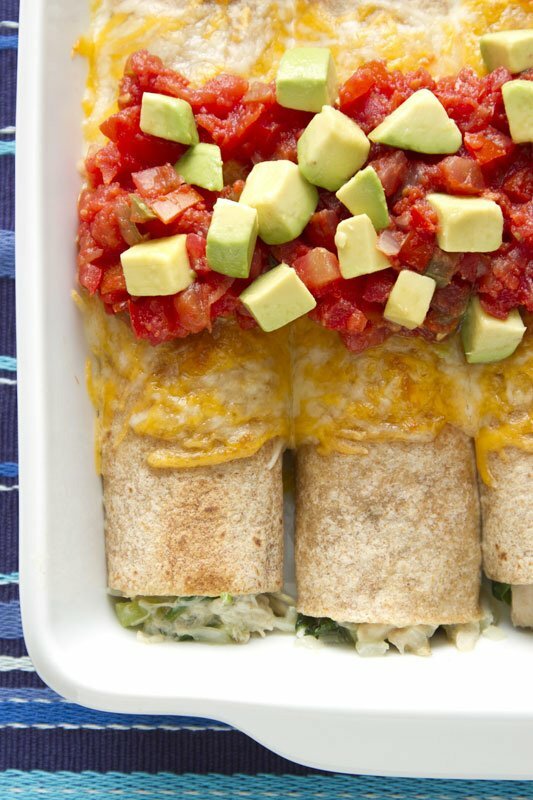 Top with 1/2 cup salsa and cheese and bake for 10 to 12 minutes until cheese is melted. Serve with an additional salsa and diced avocado. Pick chicken from 2 rotisserie chickens for enchiladas. Reserve the bones and scraps from the rotisserie chickens to make Homemade Chicken Stock. You can replace homemade chicken stock with store-bought, low sodium version. Place chicken, vegetables, herbs, and spices in a large stock pot. Add enough water to cover contents and bring to boil. Reduce heat and simmer for 2 hours. Strain and transfer to containers. 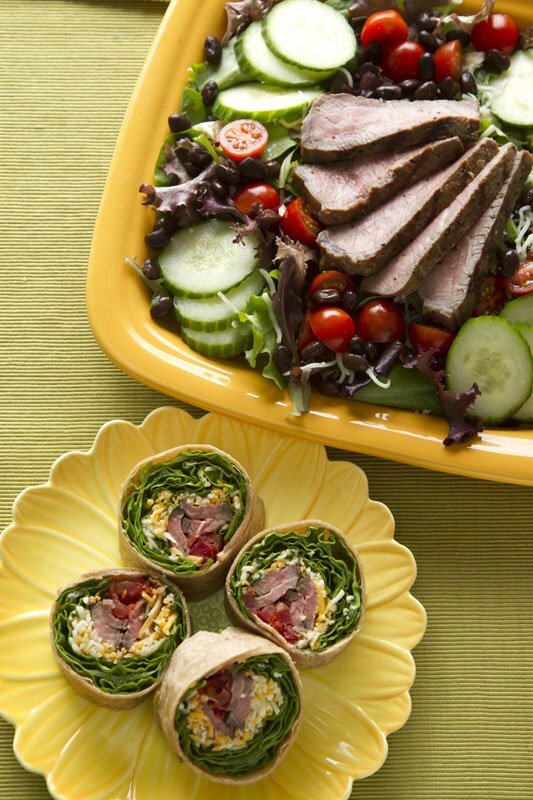 Beef Taco Wraps and Tex Mex Salad. 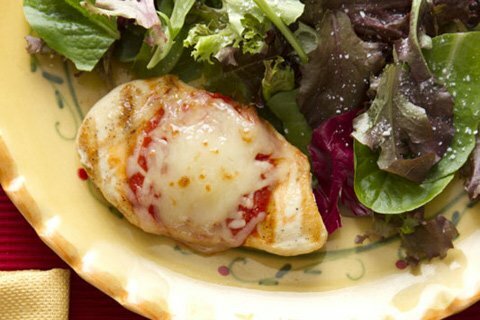 Baked Chicken Parmesan with Mixed Greens Salad. 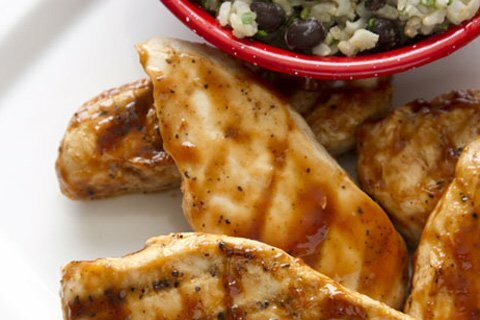 Top the grilled chicken breast with the tomato sauce and mozzarella. Bake at 350 degrees F until cheese is melted. Chicken should be cooked through when you assemble the dish, so baking it should just melt the cheese and warm up the meal. Use 2 cups of your favorite mixed greens and top with 2 tablespoons of your favorite balsamic vinaigrette. 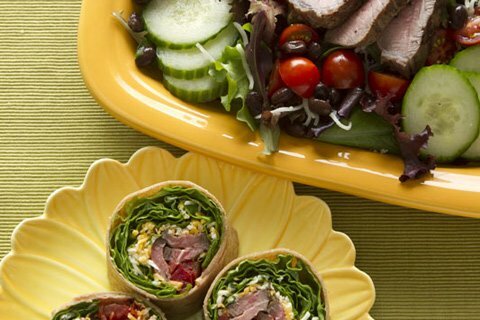 Complete the meal with 1 slice of your favorite whole grain bread. 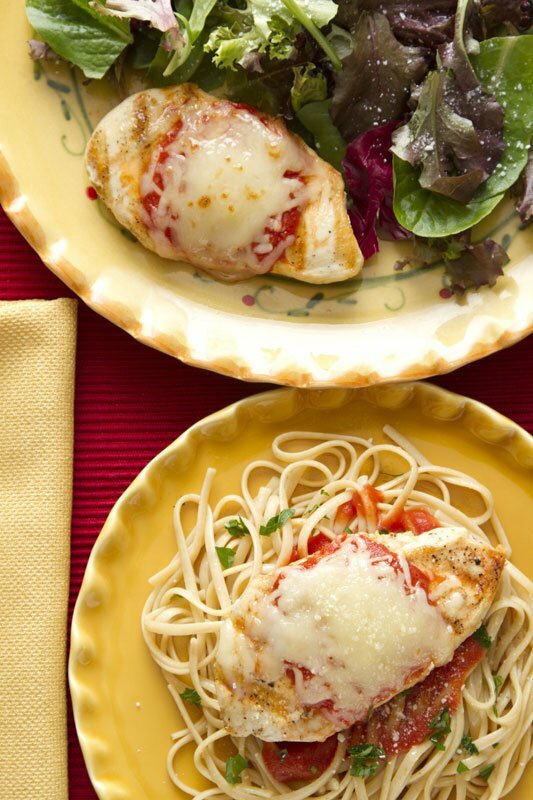 Tip: You can make 2 or 3 extra servings of this Chicken Parmesan and save the leftovers for easy lunches! Makes 20 large cookies. Freeze the extras or have the kids take them to school to share with their class. Preheat oven to 350 degrees F. Line a baking sheet with parchment paper and set aside. Combine butter, sugars, egg, and vanilla in the bowl of a mixer fitted with a paddle attachment. Mix on medium speed for 2 minutes, until fluffy. In a separate bowl combine oats, flours, baking soda, salt, and cinnamon. On low speed, add the dry ingredients to the mixer bowl and mix until just combined. 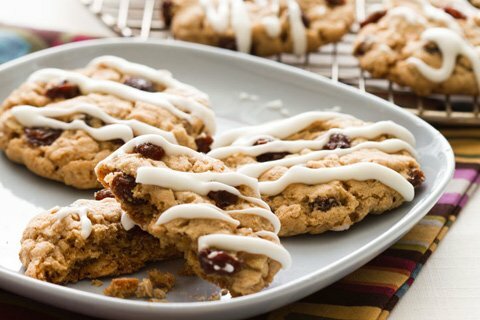 Turn off the mixer and fold in the raisins, using a spatula. 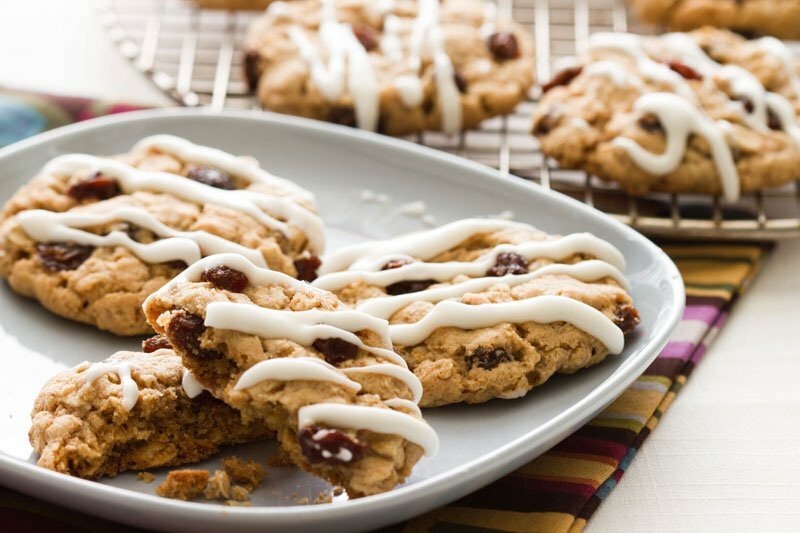 Spoon large tablespoons of dough onto the baking sheet-keep them at least 2 inches apart. Bake for 13 to 15 minutes. Allow to cool on the baking sheet for 5 minutes and then transfer to a cooling rack to cool completely. For an extra treat-make icing! Combine 1/4 cup confectioners&apos; sugar with 1 tablespoon heavy cream. Mix well and drizzle over cooled cookies. This is his first appearance on Bodybuilding.com, but not the last. Over the next year, you&apos;ll encounter training content and additional nutrition know-how from the 37-year-old. It&apos;ll all be geared toward helping you achieve your best shape ever. Is Mario a legit source of such information? Is he serious about his workouts and nutrition? I wondered the same thing when we first spoke back in 2007. Mario had reentered the public consciousness during the fourth season of ABC&apos;s Dancing with the Stars, where his physique and athleticism were on full display for millions. Mario makes fitness a family affair. The publisher wanted to steer the workouts toward training styles that DWTS fans would welcome. Truth be told, Mario would rather power through workouts jammed with compound movements using heavy free weights, exercises like squats, bench presses, and bent-over barbell rows. As his coauthor, Jimmy Pena, a certified strength and conditioning specialist, told me back then with unabashed delight: "Mario likes to train like Arnold did!" Mario also boxes, and not in the dilettantish style of most celebrities, for whom boxing serves as a fad workout. Mario, who comes from a hard-working, blue-collar family, fights competitively. Don&apos;t let the blinding smile and sunny disposition fool you: This guy could have been a pro boxer had he chosen that path. As for nutrition, the subject of his new book, Mario has been keenly aware of the relationship between diet and weight since his days as a high school wrestler trying to make weight. Even back then, Mario spoke often and at length during our interviews about the sometimes complex relationship between food and family. "Mexican cuisine might be the best tasting food in the world, but it&apos;s not necessarily the healthiest, at least not the way it&apos;s traditionally made," he told me. "You can cook it in a healthy way, but my mom and grandmother were not ones to abide by that. They would cook in lard and use other techniques that were old school. But, man, it tasted good, I&apos;ll tell you that." Unfortunately, such cooking carries a high health cost. According to the National Diabetes Education Program, 1 in 10 Hispanics aged 20 or older now has been diagnosed with type-2 diabetes. That number likely understates the problem by a wide margin, since diabetes often goes undiagnosed and, as a result, untreated. So I&apos;m not surprised by this impressive new tome, which includes simple, delicious recipes that can be prepared in 20 minutes or less; metabolism-boosting and nutritious snacks to combat hunger between meals; weekly grocery lists and tips for efficient meal preparation; and practical steps to control your metabolism and maintain target weight. Pick up a copy. Bring the family along with you on your fitness journey. If their health is imperiled by obesity, hypertension, type-2 diabetes, high cholesterol, and the like, they might be saved by the book—Mario&apos;s book. Update: Mario will be doing an Extra Lean Family book signing at the 2011 Bodybuilding.com Fitness Expo, so if you&apos;re in the area, stop on by with your copy and meet Mario!